The installation process was smoothly!, but, I needed to work with spanish language, but, I didn't know wich was the reason that I couldn't set it, neither the login page nor admin panel. Unfortunately I had to terminate the instance. By MAS, Emissary Public "Minister Mario F. Stevenson"
I had reviewed over 2,800 CRMs in my time and only a few actually posed worth the effort; few meaning less than 15. 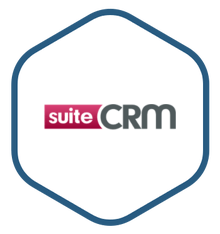 I found SuiteCRM interesting because of its potential. Herein, I refer to its potential because the integrated e-mail actually works! There are many Linux variant images having no e-mail functionality at all. So as far as I see it, if this group improves the e-mail and project management functionality, this group will enter a niche with very little competition. There are platforms having been around for decades and still can't figure to add e-mail functionality to their platforms. So blame it on the lack of documentation or the lack of decent libraries; whatever the case, this group is one of the few that accomplished it and that alone is worth the credit. I will say the group will need to adjust some of the dialog boxes and widgets for smaller screens. It appears to fit above 12". I had to shrink the browser rendering to 67% for viewing some dialog boxes. Enterprises and developers also like customizable or plain login forms, so that it gives the impression of a channel.